You may find other general enquiries of using the Samsung Pay. Samsung Pay requires an active internet connection for card registration and activation. However, an active internet connection is not required to make in-store purchases. Ideally, the device should connect to the internet once per day to ensure that Samsung Pay stays up to date. Most cards will allow you to make up to 10 transactions before you will need to connect to the internet and refresh the Samsung Pay information. No. The card image displayed in Samsung Pay may not always exactly match the physical card. 3. The last four digits of the physical card. What should I do if I lose my original card and then receive a replacement card? The cards in Samsung Pay are digital versions of your physical cards. If you lose your original card and receives a replacement, you may need to remove the respective card from Samsung Pay and register the replacement card again. For your convenience, many card issuers will link your new physical card to your digital card in Samsung Pay. This allows you to continue using Samsung Pay while you wait for the new physical card to arrive. What should I do if I receive a renewal card as the original card has expired? The cards in Samsung Pay are digital versions of your physical cards. If you receive a renewal card to replace your expired card, you may need to remove the respective card from Samsung Pay and register the replacement card again. For your convenience, many card issuers will link your new physical card to your digital card in Samsung Pay. Yes. When you disable Samsung Pay or remove a registered card, you are only suspending the digital card that has been assigned to your device for that card. If you wish to suspend your physical card, please contact your card issuer for assistance. There is no "default card" in Samsung Pay. When you open the app or activate the favourite cards by swiping up from the Home Key on supported screens, the first card displayed is either the last card you registered or the last card you viewed or used. The “Retry” button appears when the countdown timer is coming to its end and the device has not detected an NFC payment or has not received a notification of a successful payment. The “Retry” button allows you to extend the transaction time for once, without reauthorizing using your iris, fingerprint or PIN. The retry button will not be shown when an NFC transaction is completed, or if a payment success notification is received. In rare cases, the merchant may ask you for the last four digits of the card number. You will need to provide the last four digits of the digital card number, instead of the last four digits of the physical card. 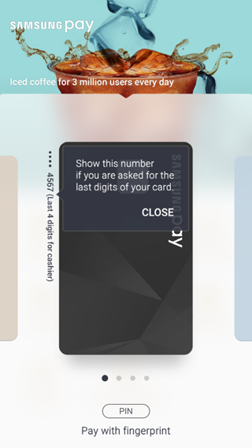 For ease of use, it is located on the left side of the card in the favourite cards screen, and in the Samsung Pay app when viewing your registered cards.